This book was shortlisted for the Folio Prize 2015. It is longlisted for the Baileys Women's Prize for Fiction 2015. "Winter bouquets should be offered to the clever and stylish Rachel Cusk: her novel Outline is smoothly accomplished, and fascinating both on the surface and in its depths." (Hilary Mantel, Guardian). A woman writer goes to Athens in the height of summer to teach a writing course. Though her own circumstances remain indistinct, she becomes the audience to a chain of narratives, as the people she meets tell her one after another the stories of their lives. Beginning with the neighbouring passenger on the flight out and his tales of fast boats and failed marriages, the storytellers talk of their loves and ambitions and pains, their anxieties, their perceptions and daily lives. In the stifling heat and noise of the city the sequence of voice begins to weave a complex human tapestry. The more they talk the more elliptical their listener becomes, as she shapes and directs their accounts until certain themes begin to emerge: the experience of loss, the nature of family life, the difficulty of intimacy and the mystery of creativity itself. 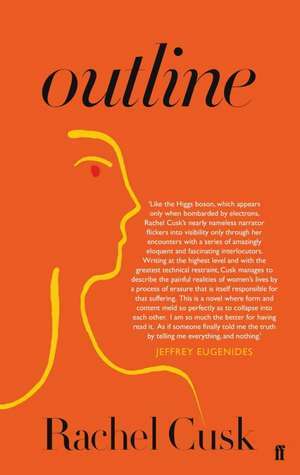 Outline is a novel about writing and talking, about self-effacement and self-expression, about the desire to create and the human art of self-portraiture in which that desire finds its universal form.